The bit is an important complement to the peruvian tack in the headgear or “jato”. This is a typical bit, originating in Peru, with some similarities to the historical spanish bits, especially in the port (with rollers) and shanks. Its uses are similar but more varied in the way its used as the peruvian enfrenadura is also different and unique in the world. if their teeth are square. Then we’ll look at the width of the corners of his lips. if they are overbent at the pole. Then we will know how and which bit to use, as well as the height of the bits’ placement. 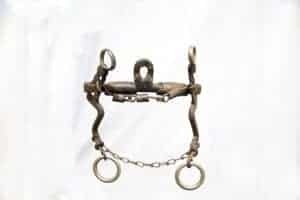 A master trainer must have different types of bits available for the proper use of the bit at the precise moment, to be able to make a well-trained horse instead of one simply carrying the bit. 2nd. – Starting with the bits made by the master bit maker “Galeano” in the present era, continuing by the master bit maker “Abraham Godoy”. Then with time they started using stainless steel. Bits with normal shanks, movable, different mouthpiece widths and with a normal port. Bits with long shanks, normal mouthpiece width, a large port with hole, forming an arc with a knob in the center and solid curb chain with a weight Approx. 450 Grs., and with a hook for the adjustment of the chain with 12 links. This type of bit is used for which are stargazing, or horses who are heavy on the bit. There are also two small eyelets in the upper part of the shanks and below the mouthpiece for the use of the. 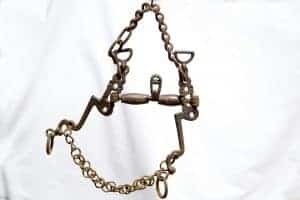 Bits with short shanks, narrow mouthpieces, a small port and regular weight of curb chain is used for horses with a more sensitive mouth. These were lighter with a weight of approx. 380 grs. The bits called “Rivet”, where the shanks were fixed and could not be moved. These bits were for daily use in the field and also for the mules, with a serrated or half crescent moon curb chain. These are harsh bits. All the bits descirbed above had two rollers. It should be noted that the curb chain generally consists of 12 links is scaled to hook on the bit. Remember that adjusting the curb chain snugly helps to position the head of the horse more broken over at the pole, and loosening the curb chain helps to position the horses head higher or more free at the pole. These aspects are determined by the trainer, according to the progress and behavior of the horse. The normal bit, without openings for the gamarrilla and normal shanks, a normal port and curb chain with 12 links, with a hook. This bit is for finished horses. A bit with long & thick shanks, with openings for the gamarrilla, a slightly larger port, and curb chain with 12 links or a half moon curb chain, with hook. This bit is for horses with a harder mouth. The bit of shank and spindly, lighter. With openings for the gamarrilla, a large port, with or without decorations, with a curb chain of 12 links. These are used for horses with a softer mouth. Both the previous bit and this one are for horses that are somewhat stargazing, ones who do not carry their head correctly, for those who have a hard mouth. The bit with short shanks and slightly thicker, with openings for the gamarrilla, a normal port, with a curb chain of 12 links. This is used for horses in general without problems of headset or mouth. In the case of the horses who are overbent at the pole, this bit is ideal because with short shanks, it gives the rider less leverage and relieve the position of the head of the animal. 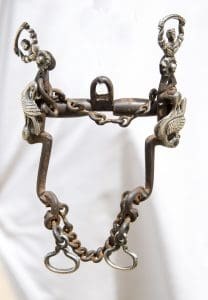 Finally we have the bit for use of mules; normal shanks and thick with normal openings for the gamarrilla, a slightly larger port, with a half moon metal curb chain. This is similar to a bit with longer and wider shanks than the normal bit.  The maquinaria is used when working in the stage of four reins. At the top there are two loops to connect to the bridle and two openings for the gamarrilla. The mouthpiece, the two rollers and the port are a normal size. It has a regular curbchain. At the bottom back of the mouthpiece, the maquinaria has two openings larger than the openings for the gamarrilla where leather or rawhide loops are inserted and connected to a first set of reins attached to a smooth rounded solid half moon piece of metal which works as a curb. The shanks also have the normal loops to connect a second set reins like on a typical bit. The filete criollo, like the maquinaria, serves to ease the preparation of a horse for the bit and should only be used after the bozal on a horse which is already supple at the neck. At the top of the shanks, which are movable, there are two loops to connect the headstall to. The mouthpiecs has 2 normal rollers and a normal port, and openinings for the gamarilla. The bottom of the shank is wider and has a round opening on each side where leather or rawhide loops are inserted and connected to a set of reins attached to a smooth rounded solid half moon piece of metal which works as a curb. These last two bits serve to lighten the training of a horse, a shortcut of sorts. 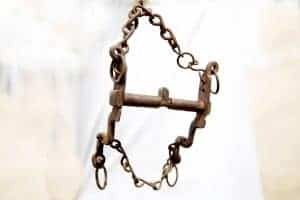 They were generally used in the large land estates where the trainers had to train 20 to 30 horses for use by the field staff in the shortest possible time. These bits were certainly not for the use of a enfrenadura exhibition and much less, for bullfighting on horseback. These types of training require gentle, more detailed training as well as patience to correct the defects. All the bits mentioned above have a normal bar and generally have 2 rollers. 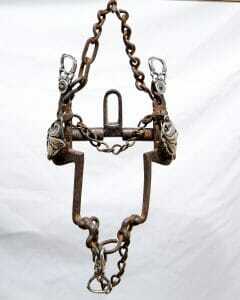 We must remember that the chain is adjustable and serves to help with the headset of the horse. This curb chain can be hooked at a graduating degree of any of the 12 links. For a horse that needs to drop their nose, you would adjust the chain tighter, and looser for a horse which needs to release their nose and not be so over bent at the pole. It should also be noted that the only use of additional rollers on the mouthpiece is for horse to play with their tounge more. This piece is complementary to the jato and is not necessarily used. It serves to prevent the horse ‘s mouth from opening ; consequently this helps the horse to better hold the bit. It may be entirely made of braided rawhide or with a half moon piece of metal, with or without a hinge. The gamarrilla is not a part of the jato, but an additional piece of equipment that serves for the education of the horse and for protecting the bars of the horses mouth. The straps are adjustable with holes for the correction of the training to be done with respect to the adjustment for the softness of the mouth.